FLORIDA/GOSHEN—The Wonderbar on Goshen’s Market Street has seen better days, but to Robert Knebel, the new owner of the three-story, brick building, it couldn’t be more perfect. Knebel, a Warwick resident, is a general contractor and real estate investor who has flipped several buildings in the Village of Florida, including his own office on North Main Street. He got into real estate because, as he put it, “there’s no retirement for a guy in construction.” He buys old properties at a low price, fixes them up, and then eventually recoups the costs through rent. Walking down Florida’s Main Street he points to the four buildings he has invested in and all the changes he has made. He has increased the property value of the village so much, he said, there are no more affordable properties left to buy. “To the point where I went to the next guy that has a dilapidated building and I asked him if he would sell it, and he goes, ‘Sell it? You just doubled the price of my building,'” he said. Seeing no more potential for development in Florida, he has set his sights on Goshen because of its historical charm and potential for economic growth, especially once the Government Center opens. The other determining factor in his investments is the attitude of local government towards investment. I think that Goshen is a gem. It’s a diamond in the rough that needs to be polished. He met Village Mayor Kyle Roddey at Sweet Onion Brewhouse, a restaurant that is in one of the buildings Knebel renovated, and where Roddey is a manager. What he likes about Roddey, he said, is his “forward thinking” and “hands-on” style, and said he is excited about initiatives like turning Market Street into a pedestrian park, that Roddey has spearheaded. “I’ve worked in three different villages and I would have to say that he is the most progressive mayor and aggressive in getting things done for the village,” Knebel said. 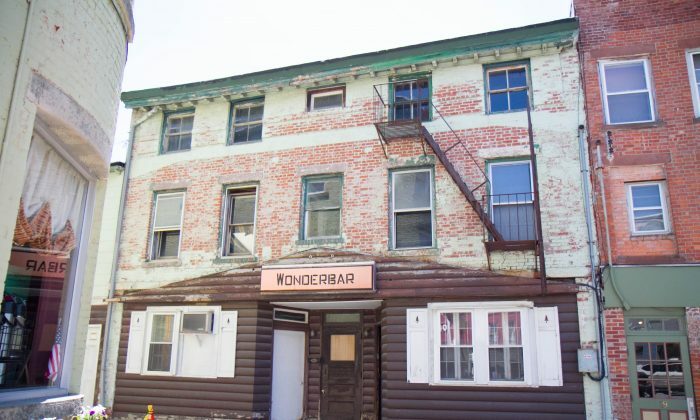 Knebel bought the Wonderbar on May 24. Already he was going through the motions to get his plans approved so he could move quickly once it closed. His plans call for a mix of commercial and residential use on the first floor and residential on the second and third floors. As for the commercial space, he has gotten offers for a clam bar and a European café with a play area for children. He has also entertained the idea of a self-serve salad bar. I’ll be selective [as] to what goes in there so that it does fit into the village. “I’ll be selective [as] to what goes in there so that it does fit into the village,” he said. As for the front, the log cabin-like façade that juts awkwardly up to a point against the brick wall will be removed, Knebel said, and its historic look restored. Across the windows he is thinking about installing wrought iron grates similar to the style in New Orleans’ French Quarter. Unlike some investors who want to see the biggest bang for their buck, Knebel is not afraid to invest a little extra to make a property more attractive. Inside the Sweet Onion Brewhouse he points to the front doors he paid $5,000 apiece for and the non-mandated iron railings he paid $2,200 to put in outside, not to mention the $69,000 he spent on a public garden that abuts the restaurant in a corridor between his building and another. When he discovered a flooding problem in the neighbors’ yard next to the restaurant parking lot, he paid $40,000 to put in a new drainage system. “I wanted to prove that I’m not a guy that’s just coming in to just take advantage of a situation and try to make money,” he said. More than just someone who flips old buildings, Knebel sees himself as an artist whose palate is brick and mortar. He said part of why he likes working on old buildings is that he has to design around its pre-existing features, a challenge that both channels his creative energies and gives the building more character. Sitting in his office in Florida, he talks about the history of the building and points out features like the pillars and the sloping walls that he had to work around. “If it wasn’t for creating things and designing things, I wouldn’t have the interest [in building] anymore,” he said. Now that he is coming close to finishing his buildings in Florida, Knebel said he was attracted to the Wonderbar building because of its 14-inch-thick brick walls, heart-of-downtown location, and historic look. While county tax records show 13-17 Market Street was built in 1900, Knebel found a bottle buried in the front from Prussia that dated back to 1876. Robert Knebel General Contractor, Inc. Originally from Bergen County, New Jersey, Knebel moved up to Warwick in the 1970’s and bought his first home in Warwick in 1980. He said he learned construction from his father, who was also a builder and has done almost every job in the business. “I’ve been on a job site since I could walk. They put me on a sand pile, [and] back in the day, that was your babysitter,” he said. He started his business, Robert Knebel General Contractor, Inc. in 1981 and his resume includes clients like T.G.I. Friday’s, Wendy’s, and Subway, as well as smaller clients who just wanted a house built or a room renovated. Roddey, who has seen Knebel’s buildings in Florida, says he welcomes any reputable investor who is interested in restoring buildings in the downtown, and considers Knebel such an investor. “I think that the more properties that get reinvestment in them is always a wonderful thing,” he said. Knebel bought the property from Gilbert Coates, whose wife’s name is on the title. According to county tax records, Coates sold it to her for $1 in 2001. Without disclosing the price, Knebel said he “came down to a place that I felt was fair enough that I could buy the building and make something of it.” He estimates by the time he renovates it, he will have spent around $1 million. Pending approvals, Knebel estimates he could finish the renovation in five to six months.